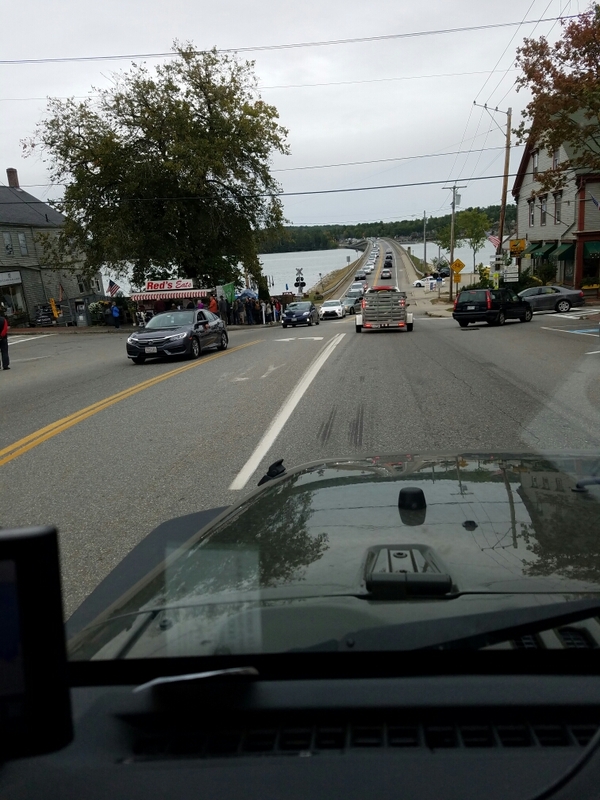 Rockport and Camden – Live MoHo! Today we got up and headed North in rainy weather toward Rockland/Camden area for a Sacramento refugee reunion! We were going to meetup with Jess and Justin Mazur and also Kevin Cartmill who was couch-surfing with Jess and Justin. Kevin lives in Costa Rica and has been doing a really cool sustainable housing project called Eco Oasis. Our MoHo might not be sustainable, but I keep telling myself our environmental footprint is smaller than it used to be. According to Google, Camden about 2 hours of driving time. Costa Rica is just a bit further. One thing I have started to learn about Maine is that aside from I-95 which runs sort of up the middle of the state, there aren’t many major roads. Or major towns. The central coast area we were heading toward is reportedly beautiful, but its also relatively rural. For fun, look at a map of Northwestern Maine. See those roads and towns? Neither do I. Central Maine is positively urban by comparison. 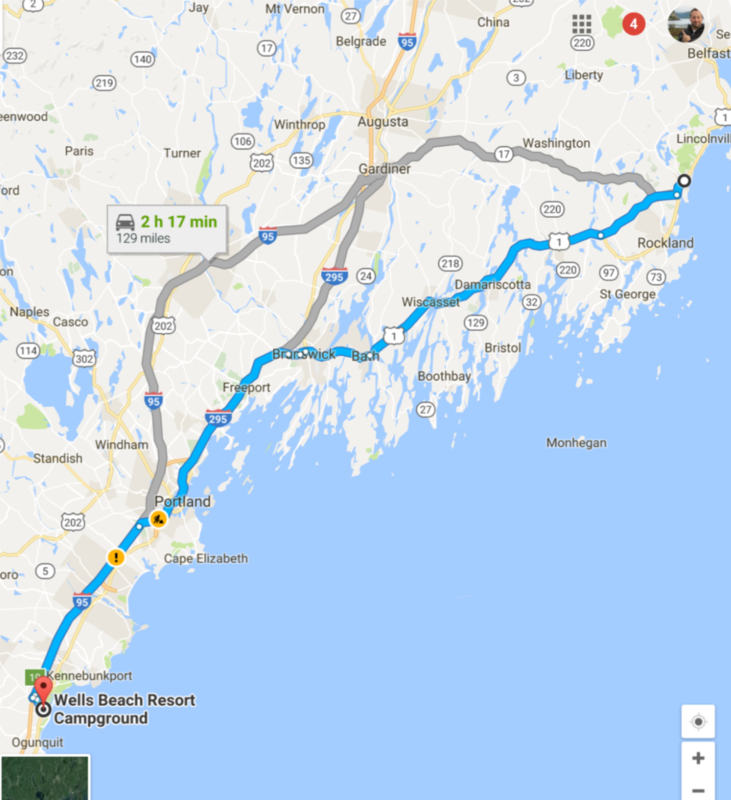 Maine has almost as many toll booths as Florida! Nah, not really. Nobody has as many toll booths as Florida. But it does have a few. Tip – in almost every place we have travelled, the far right lane is the one that large RVs have to use. Traffic in the little towns was heavy. It was especially thick in Wiscassset. As we drove through we noticed a little red neon sign advertising Reds Eats. If you look closely, you can see that line of people stretching around the block and almost back to the water! There are probably more people in that line than actually LIVE in Wiscasset. We didn’t know it but Red’s is supposedly home to Maine’s #1 lobster roll. Not that I doubt Red’s claim, but a few years ago geographers from the University of Maine conducted a survey and determined it is not possible to travel more than 148 feet in any direction in Maine without passing a restaurant claiming Maine’s #1 best lobster roll. Still, that line at Red’s Eats makes me think the lobster rolls are pretty good. Or their marketing is REALLY good. Considering that little shack is 100% kitchen and 0% marketing department, I’m going to say its the food that draws the crowds. No lobster rolls for us though. We were on a mission to get to Camden, and thanks to traffic we were running about 30 minutes behind schedule. Red’s would have to wait. Jess had promised lunch at a Scottish Pub and damn if I was gonna miss that!! 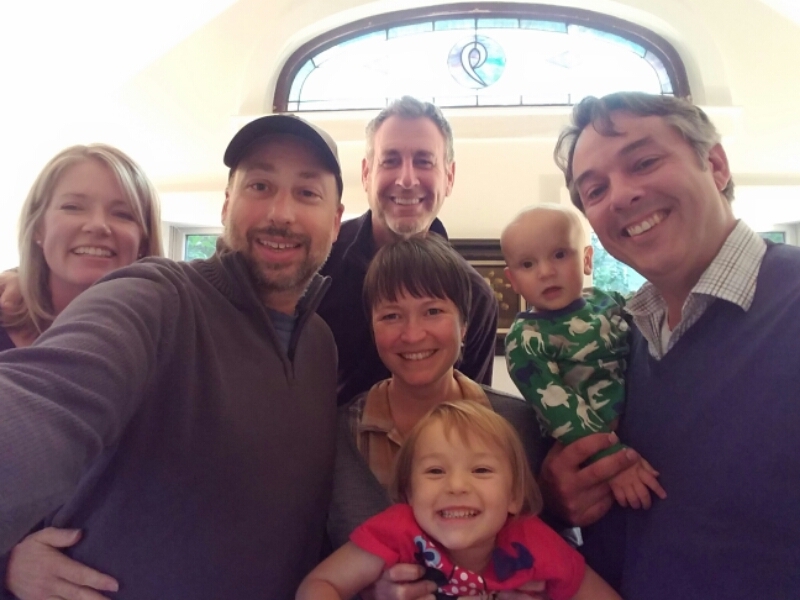 We arrived at Jess and Justin’s house and the Sac-town reunion was on like Donkey Kong! Everybody looked great! Even me, in spite of the half-amazed, half-confused look I usually have when I’m trying to frame up a mega selfie shot and am not sure if I can hit the shutter button with my thumb. 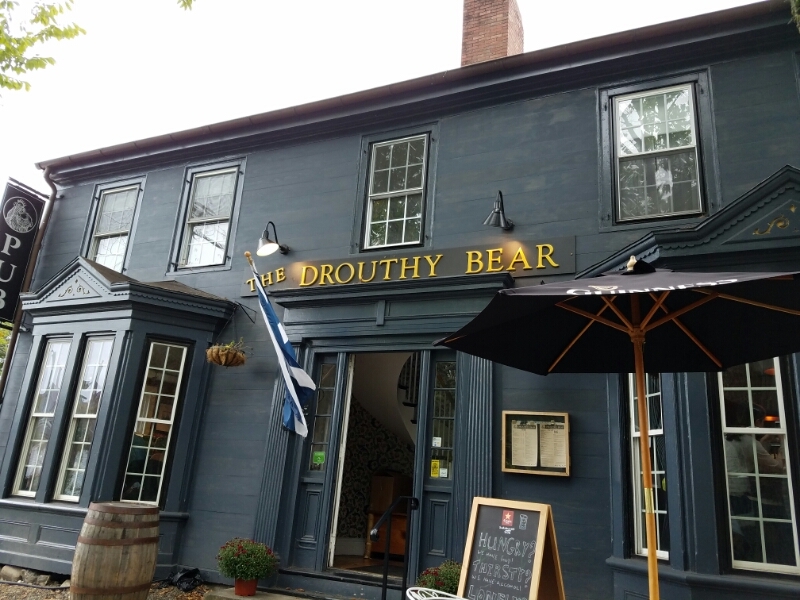 As promised, our hosts took us to the Drouthy Bear Pub in Camden. Drouthy means “thirsty” in Scots, by the way. And if ye nae speakit Scots yer jist an nyaff numpty. Food was delicious and the ambience was perfect. The Scottish owner threatened us, fell down the stairs piss drunk, and then haggled with us over the price of a pint. Nah, not really. That would have been TOO authentic. As the Scots say, “a full wame makes a straight back.” Meaning, with our thirst quenched and our bellies full, it was time to set off on a walk. Let’s see Camden! 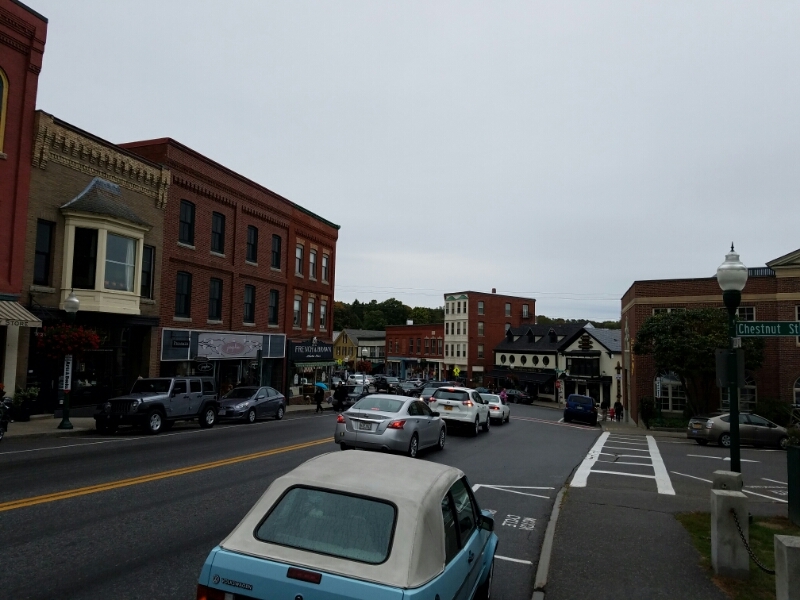 Downtown Camden is very charming and very Maine. I kept looking around for a small shop called ‘Needful Things’ or a scary old mill, but I didn’t see either one. I’ve read enough Stephen King books to know both are here somewhere though, along with unspeakable evil lurking in the storm sewer. In the daylight, we saw no monsters lurking about. We did see the store for the company Justin is working for, Swans Island Company. 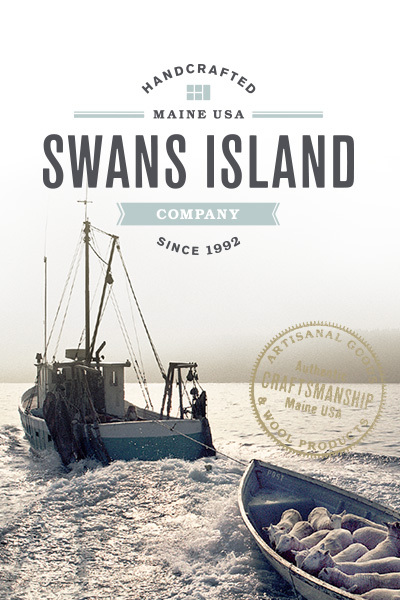 Swan’s Island Company was started by two Boston lawyers, John and Carolyn Grace. They were looking for a more fulfilling lifestyle and settled on the islands of Maine which had a long history of sheep farming and wool production. They started working with local craftspeople in the 1990s and began recreating the lost arts of handcrafting high-quality woolen fabrics. Including using local dyes and hand looming the wool. It is hard to believe in this day and age of disposable, mass-produced, imported fabrics that small-batch artisan hand production like this still exists, but it does. And the rocky coast of Maine seems like a perfect place for it. Walking down to the small bay, we saw the river which actually flows right under Camden’s main street and the buildings along its edges. It emerges under Marriners Grill and the Camden Deli and runs down a rocky series of small waterfalls into the bay. 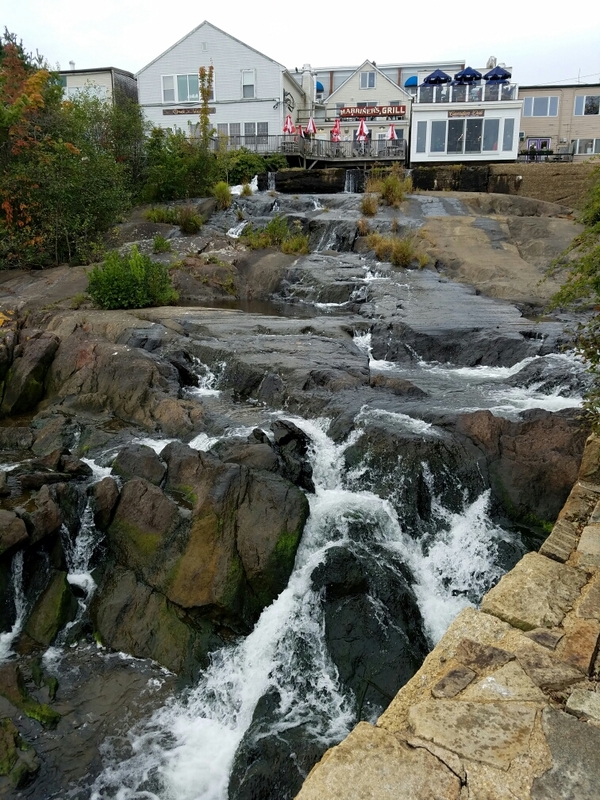 Since it is fall, and Maine being in a drought, the water was just a trickle. Apparently in the spring or after a heavy rain the water can roar down these falls. 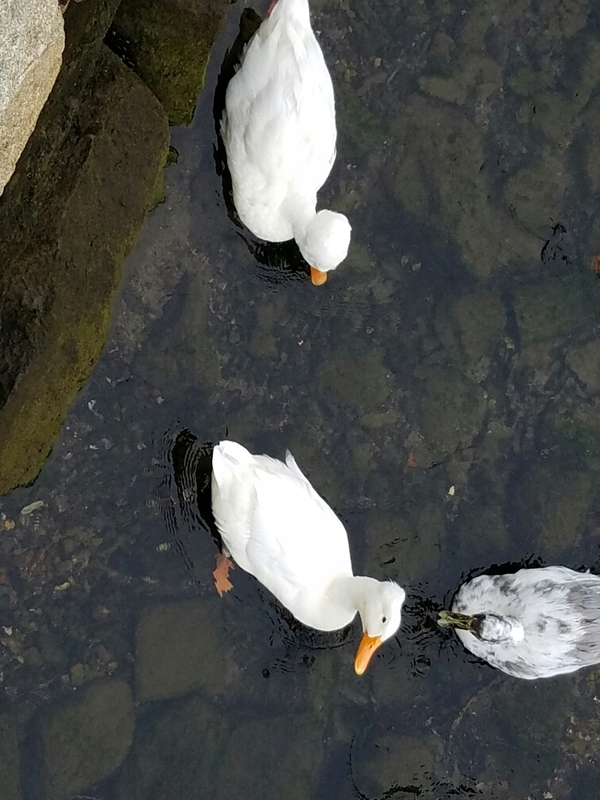 A flock of white ducks was foraging for food right at the base of the falls. They had a puff of white feathers on their head that looked like a little cotton ball. 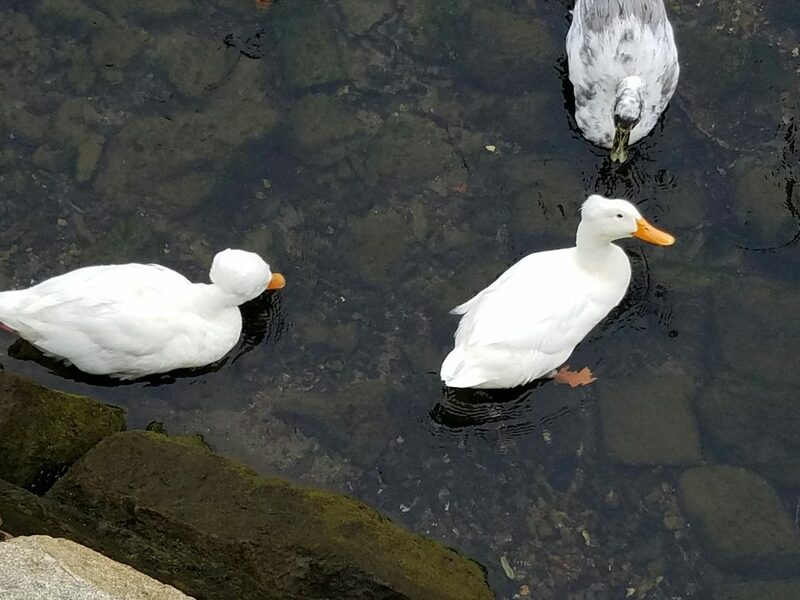 According to Google they are called White Crested Drakes. After seeing the downtown Camden area, we drove up to the top of a mountain – the name of which I forgot already. I think it was Mt. Battie? Hopefully Jess, Justin, or Kevin can refresh my memory. The views, however, I will not forget. Incredible! 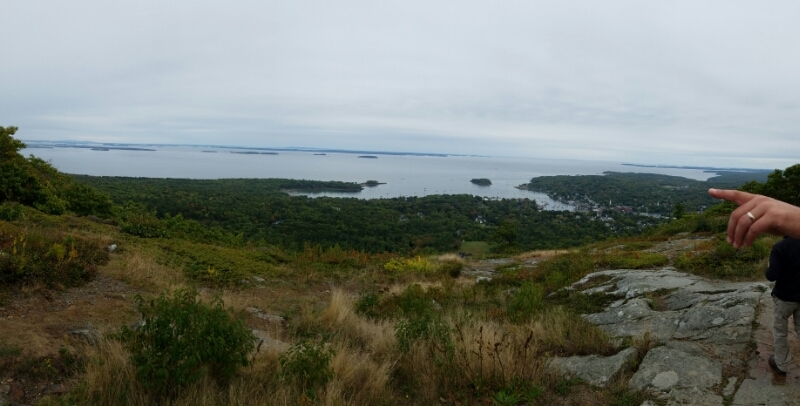 Downtown Camden is just to the left of Justin’s finger in this photo, with Penobscot bay and the many islands visible on the horizon. The picture just doesn’t do the scene justice! Sadly, the day was wrapping up and we had to drive back down South. Which mean we had to say goodbye to everyone. It was a great visit and I surely hope it won’t be so long before we meetup again!! Meanwhile, if you have a chance to drive up the coast to Camden, you should do it!